A way to live colourful life : Activities are the part of life which makes us enthusiastic and energetic and lead us to live life in joyful manner. Education is incomplete without activities. These activities explore the talent of young learners, identify their hidden potential and encourage them for participation and develop healthy competition. These are the medium to make students attached with the environment of the college and feel like a family members of group. A New Environment, a new start and a new day of college is always full of hesitation for new comers. To remove hesitation, to make them familier to college life, welcome day is celebrated. On this day lecturers and students introduceseach other. New Comers are welcomed by old students in traditional way. They share their experiences, new comers introduce themselves and show their talent in cultural programmes. One special contest is also organized to select most talented students of college, who is awarded as Miss Fresher / Miss Rawat. So this is the way to get brief introduction of college also. The Focus of Welcome day for new students is to get in touch with the campus and surrounding community. While in campus students will learn about the support services and resources available, residences and libraries. By the time you leave welcome day, you will feel prepared and ready to start your semester new session at RawatMahila B.Ed. College. In modern era English has got most significant place. For every job English Speaking Skills must be develop properly. To develop Spoken English Skills among students personality, grooming and Spoken English Programme are organized in College. Modern techniques are used and experts are invited to make students well versed in Spoken English. These special workshops are regularly organized by college to make them confident and self reliant. Dr. APJ Abdul Kalam says English is necessary as at present original works of Science are in English. We offer a wide range of English speaking courses for students as these skills are significant for the success of an individual. Bearing this in mind, we have taken up the mission of breaking down the barriers that hinder the progress of a person as on individual. Specialist tutors will develop a personalized programe of study with you and fully support you to improve your English language skills. After leaving school when student enters in the world of college. It seems totally different from school life. They are mostly little bit anxious, fear filled and with lot of queries regarding new atmosphere. At that time they need proper guidance, which is provided by expert counsellors via orientation programmes. In there programmes by can find different aspect to career. Rawat Mahila B.Ed. College provides them chance to express themselves. In this large world by developing their confidence. Starting college can cause much anxiety in the heart of a new college student because of all the unknowns - 'What should my major be ? Will I make any friends ? How will I find all of my classes ? Whom do I ask if I have a question? 'New student orientation programs are designed to guide students in answering all of these questions. Prior to the beginning of classes, students are given on over view of the complete realm of university life, from academics to social activities, through a period of days referred to as orientation. Freshman Orientation provides students the opportunity to meet other incoming students beginning their first year of this College. The programs, speakers and activities scheduled for the two-days Orientation Program will focus on the issues and resources that are most important to new students. Freshman Orientation is also a great way to find out how you can become involved on campus and speak to current. Orientation programme is followed by micro teaching classes. During this session Teaching skills are developed in pupil teachers. India is the country which is full of diversity. To keep youngsters attached with diversity cultural activities are organized in RawatMahila B.Ed. College. They express their talent as poet, dancer, artist and performers. 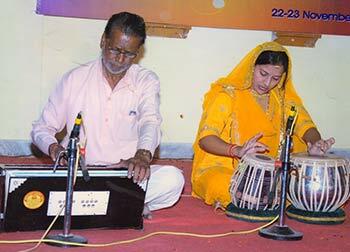 These activities help to develop various talents of students. Healthy competition is the part of youth week which develop confident among students. During this week intercollege contents are also organized. All arrangements are done by students only under the guidance of lecturers. Traditional dances are also performerd during this week as GhoomerGarba. etc. Which reflect the glimpse of colourful India. Youth week's vision is : 'A country where young people are vibrant and optimistic through being supported and encouraged to take up challenges. 'Youth week aims to create a society that values young people and affirms their diversity. The week highlights the amazing things young people do all year. The youth week is celebrated at RawatMahila B.Ed. Collegeevery year under which various academic competitions are held all the position holders including those who bogged second and third positions receive prizes. ‘Kindness is the sunshine in which virtue grows’ college emphasis on inculcating values respect towards nation and social awareness. For that purpose students are motivated to be involved in social awareness programme like blood donation camp, cleanliness campaign, anti tobacco campaign etc. Blood is the most precious gift that anyone can give to another person the gift of life. RawatMahila B.Ed. College organized a blood donation camp in December at College Campus. Students and Lecturersdonated their blood for a good reason of course to help the needy one. The volunteers of the college demonstrated over whelming enthusiasm while donating blood for the cause of humanity. Their spirit of social work and urge to serve the needy was the praised by the organizers. Every year our nation requires about 4 crore units of blood, out of which only a meager 40 lakh units of blood are available. Blood donation is a sale process. There is a constant need for regular blood supply because blood can be stored for only a limited time before use. Regular blood donations by a sufficient number of healthy people are needed to ensure that safe blood will be available whenever and wherever it is needed. For Cleanliness Campaign relly and skits were organized. In anti tobacco campaign students organized huge relly to make people aware about harmful effects of tobacco.Also to celebrate Human Rights Day, World Aids Day rallied and organized. Rawat Mahila B.Ed. College believes in creative job generator then job seekers for that it provides better job facilities and career guidance by specialist. Placement cell is set up to provide students a right direction. Knowledge with practical aspects remain permanent in students mind. Educational Tours are the best ways to develop thinking skills of students and to make them aware about outer world. These tours are an interesting medium to provide knowledge in natural surrounding out of the classes where they can explore their minds and get wings of new thoughts to fly in the sky of education. Educational trips in India and abroad are regularly organized to inculcate personal and professional values including teamwork, resourcefulness, leadership and an ability to handle unforeseen situations. In these trips, students also get an opportunity to explore and gain fascinating insights into the rich heritage, artistic traditions and diverse culture of India and abroad. Educational trips of all the stream have been organized to Mount Abu, Agra, Udaipur, KulluManali, Goa etc. Annual Day is the glimpse of all activities held throughout the year. It is the day to award talents of the year, it is the day of performers and it is the day of recalling all memories of the year through a cultural programmes. This day is celebrated with full zeal and enthusiasm most of the students participate in the function. Annual Function is celebrated by this college for completing a successful year. Students showcase their talents through amazing performances in various fields such as folk and western dance, group and solo song presentations, laughter show, kawwali, one-act play etc. Spectators enjoyed every singal performance and encouraged the best ones. College Magazine is the glimpse of the activities and talent of young learners. Students get opportunities to express their views by poems, articles and other creations. It is the asset which is the collection of emotions and thoughts. In RawatMahila B.Ed. College it is published in a very creative and unique manner. The college publishes an annual magazine which reflects the achievements, progress and activities of various departments. It contains articles on various topics in many languages i.e. English, Hindi and others. Students are encouraged to contribute articles to the magazine. The Rawat Mahila B.Ed. College publishes news letter in every three months. The letter includes each & every programme and celebration during this period. God our creater has stored within our minds &personalitieswith great potential strength and ability. Prayers helps us tap and develop these powers. In this materialistic world every one is busy in getting solution of their problems. Every one is in search of peace. Now a days students are also surrounded by worries, regarding studies and depression also, so we organized meditation camps and the lectures on spirituality by experts. So that learners can increase concentration and can get rid of worries. As college focuses on spiritual development it enhances devotion towards god and guide true direction to students so that they can face every challenge of life easily. They can have faith in themselves and get strength which is must for success.